Successfully Added DJI Mavic Pro Camera Drone Combo Pack - GPS/GLONASS, 4 Mile Range, 4K Camera, 3 Batteries, Carry Bag, Folding to your Shopping Cart. DJI Mavic Pro folding drone Combo Pack. Now with 2 extra batteries, car charger and spare propellers all coming in an awesome shoulder bag for easy carrying. Now you can get this stunning DJI drone with all the extras you need. Coming with 2 extra batteries you can quickly land and swap them out so you'll enjoy 3 times the flying time. You also get an extra 4 propellers in this money saving combo deal. That gives you a total of 6 extras, so if you damage one you can get right back into the skies again in no time at all. With a handy car charger and an awesome shoulder bag to carry it all in this DJI combo deal equipped you with all you need for professional aerial photography. The folding DJI Mavic Pro is one of the most compact camera drones around. Equipped with a 4K camera this drone is perhaps the best new drone of 2017 and comes from leading drone manufactures DJI. Thanks to DJI patented technology the Mavic Pro has precision flight controls. The GPS support and powerful motors let it hover in place accurate. It can also auto land and take off by itself. Weighing just 760 grams this quad copter is lightweight and compact but also fast. It can ascend at up to 5m/s and has a top speed of 65kph (45Mph). It also has advanced obstacle avoidance and can detect hazards up to 15 meters away. When it comes to photography you won't be disappointed. the 4K camera boasts a 1/2.3 inch CMOs sensor and with a 78.8 degree field of view you'll get beautiful shots and video that captures the whole scene. Advanced OcuSync transmission mans you have an operational range of 7km so you can really explore all that's around you. The well thought our remote control has a phone holder suitable for most smartphones and with video streaming you'll be able to see everything you're recording with a live FPV of your flight while ever you're within 80meters of the drone. DJI really let you make the most of this drone with a stunning app that brings you a range of tools to fine tune the video recordings and even program the flight path. There is a even a point of interest mode allowing you to circle set landmark. This lest you take care of filming while the drone pilots itself around your set waypoints. 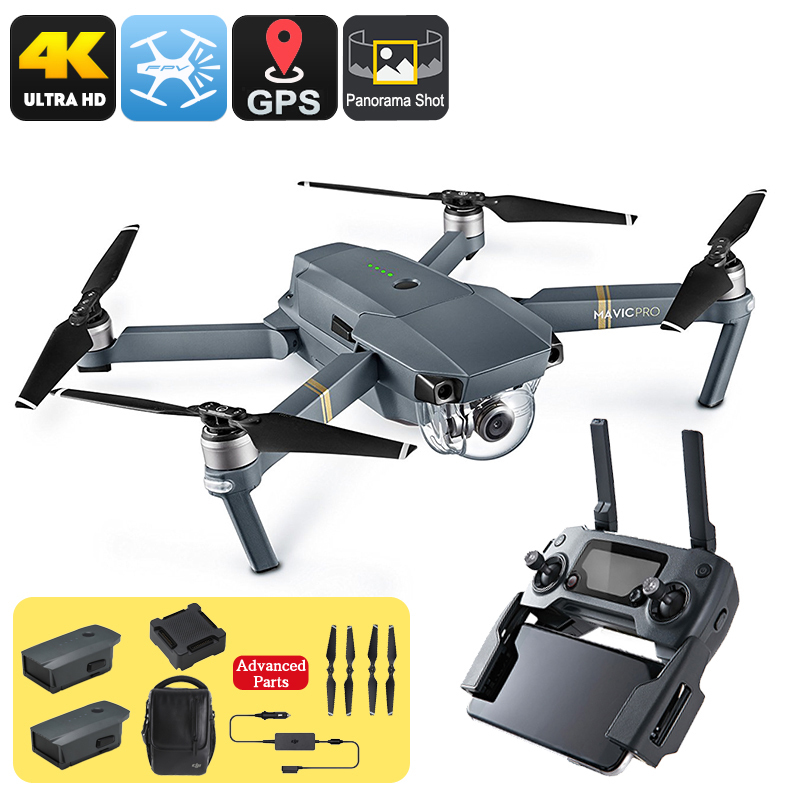 The Mavic Pro camera drone bundle comes all the extras you need and has a 12 months warranty, brought to you by the leader in electronic devices as well as wholesale quadcopters, drones, and cool gadgets..